The Vista AVS is a full-featured ABI/Segmental system designed to make the ABI and other arterial exams faster and easier to conduct, interpret and document. The system features an on-screen guide with a convenient hand-held controller to ease the exam. The Vista AVS will allow you to configure your segmental exam to fit your protocol, with full page reporting and PC download. Automatic ABI & TBI calculation. Custom segmental exams to fit your needs. Take pressures using Doppler or PPG probe for supine ABI and Segmental exams. Graphic waveform display with step-by-step instructions. Includes 9 cuffs, Qty 2-10cm, Qty 4-12cm, Qty 1-1.9cm digit cuff, Qty 2-17cm. Software package with full page reporting and exam storage, download capability to EMR systems in pdf or csv format. Ultrasound Probes/Dopplers can be found in our extensive online collection of products from globally recognized and trusted brands, including Summit Doppler. 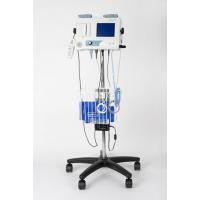 An excellent option to consider is the Vista AVS - Advanced ABI/Vascular System.